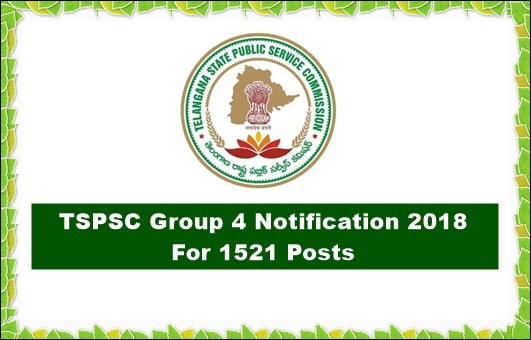 TSPSC Group 4 Notification 2018: Telangana State Public Service Commission has released Group IV Services Recruitment Notification for 1521 vacancies. Eligible Candidates can Register and submit online application form from 7th June, 2018. For more details like Eligibility, education qualification, age, how to apply, syllabus, exam dates, examination pattern please check the following article. Applications are invited Online from qualified candidates through the proforma Application to be made available on Commission’s WEBSITE (www.tspsc.gov.in) to the posts of Group-IV Services in Telangana State. The Examination (Objective Type) likely to be held on 07/10/2018 FN & AN. The Commission reserves the right to conduct the Examination either COMPUTER BASED RECRUITMENT TEST (CBRT) or OFFLINE OMR based Examination of objective type. Age as on 01/07/2018: Minimum 18 years & Maximum 44* years. Post Code Name of the Post Educational Qualifications as specified by the Departments. 01, 08, 11 & 13 LD/Junior Steno i) Must hold a Bachelors Degree of any University in India established or incorporated by OR under a Central Act, State Act OR Provisional Act OR an Institution recognized by the University Grants Commission OR any equivalent qualification. iii) Must have passed the Government Technical Examination in Short hand by the higher grade in the relevant language. If however persons who have passed the examination in Typewriting OR Shorthand by the higher grade are not available those who have passed the examination by the lower grade may be appointed. NOTE: In the case of Telugu Typist the pass in the Typewriting examination shall be on the Typewriter with Government Standard Key Board. 09 & 12 Typist i) Must hold a Bachelors Degree of any University in India established OR incorporated by OR under a Central Act, State Act OR Provisional Act OR an Institution recognized by the University Grants Commission OR any equivalent qualification. ii) Must have passed the Government Technical Examination in Typewriting by the Higher Grade in Telugu on Government Standard Key Board. iii) Provided that if persons with the qualification prescribed in item (ii) above are not available candidates who have passed the above examination in Typewriting by Lower Grade if otherwise qualified be appointed. iv) Provided further that candidates who possess Typewriting qualification in English by Lower Grade besides the qualifications mentioned in items (ii) and (iii) above shall be given preference for appointment by direct recruitment. NOTE(1): If sufficient number of candidates with Telugu Typewriting qualification are not available for the appointment as Typists candidates with English Type writing qualification may be appointed subject to the condition that he/she should acquire Telugu Typewriting qualification within the period of probation on pain of postponement of increment without cumulative effect. NOTE (2): In the case of Telugu Typist the pass in the Typewriting examination shall be on the Typewriter with Government Standard Key Board. & 16 Junior Assistant Must hold a Bachelor’s Degree of any University in India established or incorporated by or under a Central Act, State Act or Provincial Act or an Institution recognized by the University Grants Commission or any equivalent qualification. FEE: (Remittance of Fee) Each applicant must pay Rs. 200/- (RUPEES TWO HUNDRED ONLY) towards Online Application Processing Fee. This apart, the applicants have to pay RS. 80/- (RUPEES EIGHTY ONLY) towards Examination Fee. However, the following category of candidates are exempted from payment of Examination fee. Applicants have to choose any (5) Centers in order of preference. The Commission however reserves the right to allot candidates to any centre other than the centre chosen by the applicant or to abolish / create a new centre for administrative reasons. Request for change of the centre will not be entertained. A) HOW TO UPLOAD THE APPLICATION FORM: (i) The Applicants have to read the User Guide for Online Submission of Applications and then proceed further. I have applied group iv & ghmc bill collector.Both exams have same exam date.How can i attend they? Please change both exams date.